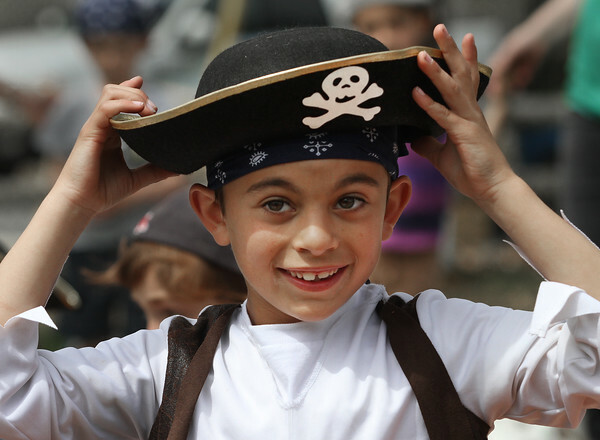 Second grader Cameron Rodolosi adjusts his pirates hat during a performance Friday by Rockin' Ron the Friendly Pirate at Eastern Point Day School in Gloucester. The concert, held on the school's front lawn, was attended by students, family and friends. It was the fifth year in a row that Ron Carter of Smuggler's Notch, Vermont, has brought his blend of family music and comedy to the school. When the performance was over, students and guests were treated to a picnic lunch.